Since opening in 2007, Mangia E Bevi Ristorante has donated more than $270,000 to oncology research and treatment at the BC Children’s Hospital and Lions Gate Hospital. When lifelong friends Doug Grisdale, Rob Parrott and Antonio Sauro decided to open a restaurant on the North Shore, they knew that fighting cancer would be on the menu. 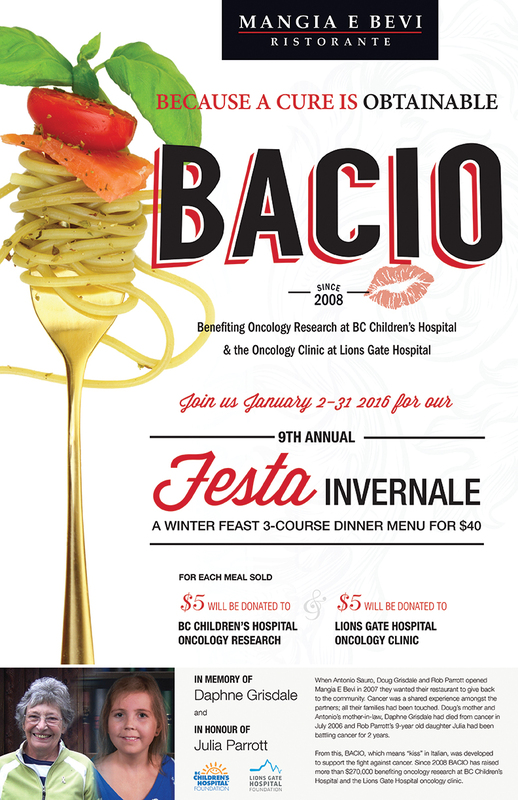 Since opening in 2007, their fine-dining restaurant, Mangia E Bevi Ristorante, has donated more than $270,000 to oncology research and treatment at the BC Children's Hospital and Lions Gate Hospital. The money is generated through their annual fundraiser, Because a Cure is Obtainable – or BACIO, the Italian word for kiss. The team was inspired to give to the local hospitals after the disease took hold of their loved ones. "In 2005, Rob's daughter – she was 7 at the time –[contracted] a brain tumour," Mr. Grisdale said. "She survived it through treatment at the BC's Children's Hospital." "And then, in 2006, my mother [who was also Mr. Sauro's mother-in-law] passed away from cancer. So when we opened the restaurant, one of the things we wanted to do was use it, in some way, somehow, to raise money to fight cancer," Mr. Grisdale said. Shortly after Mangia E Bevi opened in spring of 2007, Mr. Parrott's daughter again contracted a tumour. After another successful recovery, Mr. Grisdale, Mr. Parrott and Mr. Sauro launched BACIO to give back to the hospitals where their family members were treated. It has since become an annual event. Each January, the current team – Mr. Sauro is no longer part of the business – develops an additional menu for their customers, with $10 from every meal benefiting the oncology centres at the hospitals. The restaurateurs have generated $271,000 across eight years, in conjunction with a special dinner at which they auction off their catering services to private parties. On that night alone, they can raise up to $30,000. "We're pretty proud of that, for a small business, for a little neighbourhood restaurant. It feels like a pretty significant number," Mr. Grisdale said. "To be able to give back to the community like that, it's a good thing." As the sum of Mr. Grisdale and Mr. Parrott's contributions to provincial health care continues to grow, so has the total of private donations provincewide. In 2015, provincial health foundations received more than $161-million in private donations – up 52 per cent from 2010. Over the years, the province has become more reliant on private funds to keep up with new and changing technologies, as well as a rise in the costs of services. Geoff Lysters, board chair of the BC Women's Hospital + Health Centre Foundation, has seen first-hand the importance of bringing in funds for new technology. The organization recently ran a silent auction at Miss China Vancouver to raise money for a specialized piece of equipment for the newborn intensive care unit. "Through my involvement on the board I've seen what the dollars do and how directly impactful they are to women and babies across the province," he said. His experience with the foundation has encouraged him to become one of its leading donors. "I see what goes on in the hospital, I hear the stories, and it motivates me to want to support it with my time and my money. To hear some of the stories of our patient families and how they benefited from the donor dollars – it's pretty moving." Mr. Lyster's silent auction received more than $425,000 from private donors, far exceeding the initial target of $250,000. As private donations continue to play a significant role in funding things such as health care, universities and the arts, a new body of research has emerged, studying the emotional benefits of giving. "People tend to give more to causes or people they are connected to," said Lara Aknin, a psychologist at Simon Fraser University specializing in giving and generosity. "Generally speaking, people tend to feel better when giving to these causes than others because they feel a sense of social connection and greater impact from doing so." Dr. Aknin's research has found that spending money on other people leads to greater happiness than spending money on oneself, based on a series of studies, one of which analyzes the happiness that toddlers enjoy when they share. "Simply put, giving to others makes us happy – happier than doing things for ourselves."